One of my current research interests is in low gravity regoliths, and in particular the dynamics of ice and dust particles in the upper layers of a cometary nucleus. One of the main reasons for this is preparation for the Rosetta spacecraft’s arrival at comet 67P / Churyumov–Gerasimenko (for a summary, see the video I posted about previously). We have a fair bit of evidence now that cometary nucleii are covered with granular material – most probably volatile-depleted dust particles that do not get lifted from the surface by the escape of sublimating ices. Various landforms have been imaged by spacecraft that could be formed by flow or erosional processes that also imply a granular surface. But to fully understand such features, we need to better understand how granular material behaves under comet-like conditions. The first port of call in trying to answer such questions is usually the lab – for example in our comet simulation lab at the Space Research Institute we have a vacuum chamber into which we can put various ice and dust mixtures, cool them down with either liquid nitrogen or a closed loop cooler, and switch on the pumps to remove the air. By shining a simulated Sun on the surface, and monitoring temperatures and pressures, it is possible to simulate some of the suspected surface processes taking place on a comet. Such experiments are vital to understand questions such as how gas and heat flow through a porous medium under vacuum. However, they do not capture the dynamics of a real cometary surface, where the low gravity plays an important role. Just how important is it? Well, first consider that the surface gravity on 67P is something like 30,000 times less than on Earth. 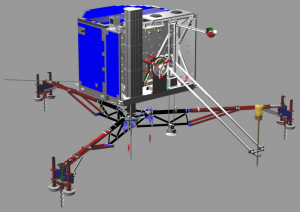 This means that the Philae lander, which has a mass of 96 kg on the Earth, will weigh only a few grams on the comet – hence it has screws built into the feet and 2 harpoons to secure itself, and even these operate only when a “holddown” thruster is firing to give some extra force. The same calculation can be applied to the weight of an individual dust particle at the surface. To see what happens to such a particle, not only weight, but other forces need to be considered – for example adhesion (“sticky”) forces, or the force of escaping gasses trying to drag the particle away from the surface. Each of these forces scale differently with the particle size. Under Earth gravity, for example, we only notice the adhesion forces when we are dealing with very small particles; since weight decreases more rapidly than adhesion as we move to smaller particles, at some point it dominates. This explains why flour acts differently from dry sand when you try to pour it. Ground flour is mostly micron sized (a millionth of a metre), whereas sand can have grains up to a millimetre in size. Because individual flour grains are so small, adhesive forces make them cling to each other, and any container they’re in. This means that they don’t flow well and are called cohesive. Coarse dry sand, on the other hand, typically flows very readily – in this case the particles are heavier and their own weight and momentum governs their motion. Now compare the situation on Earth to that on a comet – a sand grain would experience a similar adhesive force as on Earth (there are differences due to temperature and surface cleanliness, but we’ll leave that for another post! ), but it would weight 30,000 times less! So even larger particles on a comet might be expected to behave like tiny particles on the Earth. In fact from such calculations alone one can expect that even centimetre sized particles could behave cohesively under certain conditions – very different from our every day experience! However, understanding how a few particles behave is very different from understanding the complexity created when millions of such particles interact. Experiments under low gravity are certainly possible – using drop towers (think of a tall tower, pumped free of air, with your experiment dropped from the top – see the schematic above! ), parabolic flights (the so-called “vomit comet”), sounding rockets, or of course experiments on orbit. But these are either of limited duration (e.g. until your payload hits the bucket of polystyrene beads at the bottom of the drop tower! ), or very expensive (e.g. flying onboard the International Space Station). Instead one can use computer simulations. Modern computers and clusters of computers can simulate the collective behaviour of millions, if not billions of particles. Making sure that the physics holds still requires experiments to validate the models, but it’s often a lot quicker and cheaper than running hundreds of experiments, and it allows access to regimes that are hard to simulate on Earth! So that’s a little about the “why?” of running such simulations – in my next post I’ll show the software I’ve been using and explain a bit of the “how?”. This entry was posted in Science and tagged comet, ESA, Rosetta, simulation. Bookmark the permalink.